Installation is just a matter of clicking on the appropriate browser extension and opening a new browser window, which it will then be active in. The pull to refresh extension works best with trackpads and a two-fingered pull down, you will see a small black message box appear in the browser window indicating the refresh will occur if the pull is released. You can add this to the list of things to make Mac OS X more like iOS, but I’d wager that future versions of browsers will probably include this feature, which some Mac apps already support. Update: The Safari extension currently requires an Apple Developer Certificate to build and install, you can use the pre-built version posted in the comments at your own risk, or wait for the developer to release a bundled version. In the meantime, the Chrome extension is still easy to install. I’m driving myself crazy trying to get this to work. Just drag the .safariextention folder into safari? Its a folder not a .safariextz file like the extensions in my library/safari folder. 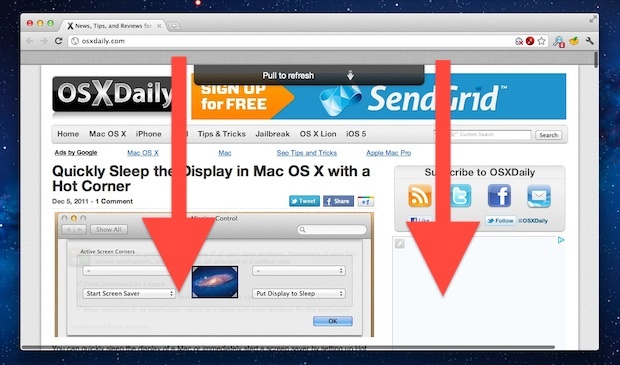 You have to build it yourself with the Safari Extension Builder from the Developer menu. The developer needs to upload a .safariextz file so that everyone can just install it the easy way, until then use Chrome. Awesome idea, but maybe have this ready for non-programmers to actually use it? You need to possess a valid safari developer certificate. You need to apply for an Apple developer, create the account, create a certificate, download it, add it to your keychain, and only then will u be able to use the plugin. Maybe it would be easier to contact the developer or wait for him to publish the signed bundle on github. Hmmmmmmmm…….. this seems like it’s more trouble than it’s worth. iOS also popularised the concept of “just-download-it-and-it-works”. Seems like a job for people who build space shuttles in their lunch break. As i said before, you need an apple developer account and a valid certificate to build the extension for safari. Personally, this extension is pretty useless. I tried it both on chrome and safari and not only it does not work well with all websites (and may conflict with some other extensions in chrome, like smooth scroll that i use on windows machines), it is also unproductive. Refreshing via cmd+R is way faster. With this extension you have some delay for the animation to occur, plus you find yourself refreshing the webpage when just scrolling back to the top of the webpage, which can be cumbersome. how do i uninstall this add-on?